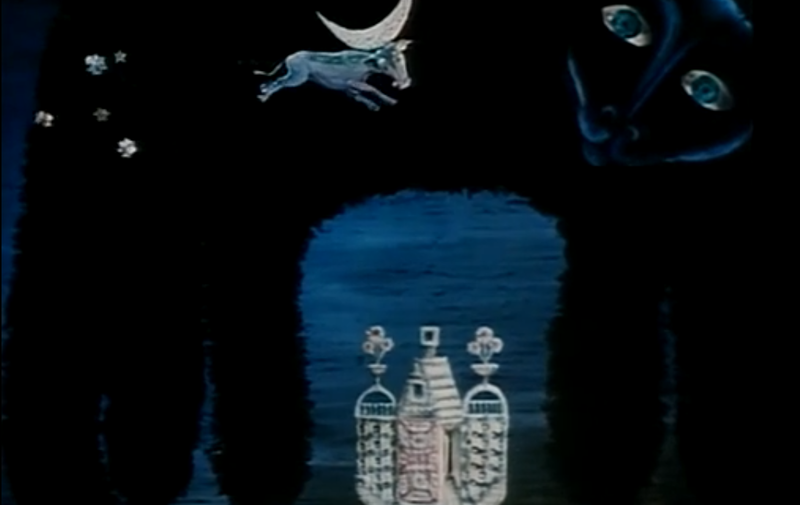 Stop motion animation all but ceased to exist during the Stalin-era Disney-inspired animation with extensive use of rotoscope technique. A Cloud in Love, with its eclectic mix of puppets and hand-draw animation, became an aesthetic pivot point for Soviet animation that turned to its avant-garde roots during the Khrushchev Thaw and well the 1960s. Stop-motion animation was usually considered subpar by children but highly valued by critics. Nikolay Serebryakov’s cartoon Ball of Wool is based on a poem by Ovsei Driz, a notable Soviet Jewish poet who wrote in Yiddish and worked primarily for children. Ball of Wool like many of his works was translated into Russian by Genrikh Sapgir, a prominent poet and author of many cartoon scripts, including such classics as Losharik. Serebraykov literally spins this story using a magic ball of wool that an old woman finds in the midst of the winter storm. She starts to knit her small world where soft woven objects are juxtaposed with harsh, edgy features of puppets. A mix of puppet and woven animation create a unique environment of this parable.